This page highlights some great apps for teaching students about Artists and Art History. Some of these apps let students take virtual tours to museums or explore famous artworks. Other apps allow students to learn about an artist by creating artwork in a particular artist's style. Take a virtual art field trip! This free app lets students explore the 2010-2011 exhibition "Abstract Expressionist New York"
Over 55,000 works of art can be explored using Art Authority. This app's price is a bit steep at $9.99 but is currently on sale for 50% off. It can be a valuable resource for the Art Room. Create art in the style of an Artist. Students can paint a digital artwork in the style of Jackson Pollock using this app created for the iPhone. Pick up this app for $.99. Students will have splash using this app! Create Roy Lichtenstein like artwork with this fun app. Students can use their own photographs or artwork to transform into unique works. This app is $.99. Art Doodles is a free app that allows students to create three different types of pictures. The first is a graffiti type picture where students can choose from different images then position and resize them. This would be a good intro to the artist Keith Haring. The second type of art students can create with this app is a Matisse like cutout design. This would be a great way to learn about Matisse and practice a design before creating one with paper and scissors. The last type of art this app allows students to create is a word collage. This is another great way to combine art and literacy and teaching students about typography and graphic design. Below is a graffiti artist example and a Matisse cutout example. Learn about Art History by Playing with It! 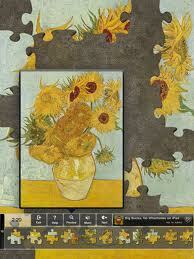 Art Puzzles allows you to solve jigsaw puzzles of famous artwork. Students will become familiar with works of art as they solve the puzzles. This would be great to use as students finish up with a project early. It would also be a great cooperative project for students to work together on. This app is free and comes with 9 masterpiece works to solve. You can purchase particular artist collections for $1.99 each. Masterpiece Me! lets you put your face into 112 classic paintings. And it's free! Students will have fun creating parodies of famous paintings. They could use their own faces - or better yet insert their own drawn face into it.